BEIJING — China is pushing for exports of industrial capacity, a new economic dynamic. Premier Li Keqiang will witness the signing of several deals on industrial capacity cooperation in Brazil, the first leg of his Latin America tour, said Chen Duqing, a former ambassador to Brazil. 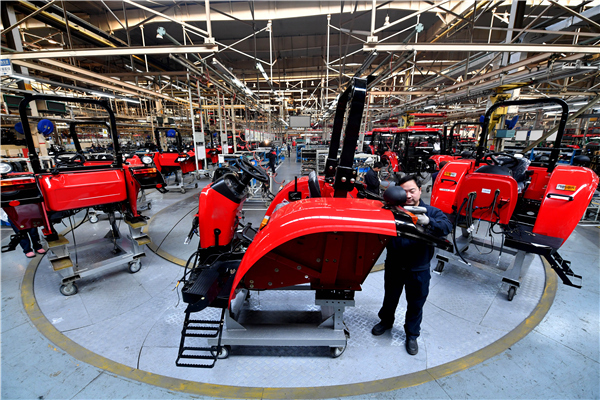 Industrial capacity cooperation generally means that China moves entire production lines to other countries, or sets up factories with local partners abroad. Zhou Zhiwei, a researcher on Brazil with the Chinese Academy of Social Sciences, said Brazil with its outdated infrastructure and insufficient foreign investment craves an industrial upgrade and China has a huge industrial capacity with relatively advanced technology. “Industrial capacity cooperation will be a major force in China-Brazil economic ties,” said Zhou, predicting that Chinese investment in Brazilian infrastructure will surge. Li’s Latin America visit is part of a broader campaign in which China is selling its under-utilized industrial capacity abroad. On May 16, China’s cabinet laid out a list of sectors for more capacity cooperation. The expansive list includes automobiles, aviation and aerospace, chemicals, construction materials, electric power, machinery, maritime engineering, non-ferrous metals, railways, shipbuilding, steel, telecommunications and textiles. Earlier this month, the cabinet decided to deepen international industrial capacity cooperation, at a time when China is struggling with overcapacity. Too many similar factories are churning out fundamental products including iron and steel, cement and plate glass. Over the last decade, manufacture of high-end equipment in China, including automobiles, bullet trains, electricity generators, and ships, has increased rapidly and to the extent that China is now a world leader in some sectors. The current slowdown has hit overall demand, slashed factory prices and manufacturers are having a tough time. The producer price index (PPI), a measure of the cost of goods at the factory gate, plunged 4.6 percent year on year in April, the 38th straight month of decline. “The government will work to help Chinese companies ‘go abroad’ amid the industrial capacity cooperation drive,” said the cabinet guideline, promising more tax breaks and cheaper loans. In the first quarter, non-financial companies from China invested a total of $25.8 billion in 143 countries and regions, up 29.6 percent from the previous year. The cabinet did not set a target for investment growth, but vowed to make significant progress in major cooperation projects and nurture a number of big companies with global competitiveness.